Opus Anglicanum at the V&A. (c) Victoria and Albert Museum, London. The V&A Museum opened its latest medieval exhibit exhibit on Saturday: Opus Anglicanum: Masterpieces of English Medieval Embroidery. I had the opportunity to see it opening day and it was spectacular. The show appeals to everyone, be they fashion historians, crafters, or the general public. You don’t have to know anything about embroidery to enjoy it and appreciate the time and skill it took to produce these masterpieces. Opus Anglicanum is Latin for “English work”. The term was coined in the thirteenth century to denote these incredibly beautiful English works of gold, silver and silk thread. English embroidery during the High and Late Middle Ages was renown across Europe for its exceptional design and craftsmanship. Embroidery was done in gold, silver gilded and silk thread and decorated with pearls and precious stones. Embroidery was not a craft entered into lightly; embroiderers took seven years to master their skills. The workshops were run mainly by men, although there were some professional women embroiderers. Opus Anglicanum exhibit at the V&A. (c) Victoria and Albert Museum, London. The embroidery was full of elaborate religious imagery, fantastical beasts and heraldic symbols and was in high demand at papal courts. This particular series was mainly made in London and many of the embroiders of these beautiful pieces were workers from St. Paul’s Cathedral. While most of the works are religious vestments such as copes, shoes, mitres, burses, orphreys, and stockings, there are also beautiful secular objects on display: seal bags, family emblems, guild funeral palls, psalters, and ivory carvings. In the later Middle Ages, the work expanded from predominantly religious attire into the design of chivalric garb, and heraldic crests. Interesting fact: the position of Royal Armourer was often held by an embroiderer. By the fourteenth century Opus Anglicanum was at its zenith, with kings and queens commissioning expensive and intricate designs to send across to Europe as diplomatic gifts. After the Black Death embroiderers used time saving practices to keep up with demands, such as separates that could be attached on silk and velvets, and reused as patterns. There was also a change in materials as well, elaborate silk fabrics were imported. Part of a horse trapper probably made for Edward III’s Court (detail). 1330-1340, Photo © RMN-Grand Palais (Musée de Cluny – Musée National du Moyen Âge) / Franck Raux. Many of the earlier medieval religious pieces have been preserved because they were buried with bishops and abbots, and as a result, the colour from the gold, and silver thread has stood the test of time. While the popularity of English embroidery peaked in the thirteenth and fourteenth centuries, it was still requested for secular, private work wells into the sixteenth century. Sadly, much of this exquisite English embroidery was lost during the upheaval of The Reformation . Pieces were often hidden by English Catholics or sent to Europe for safe keeping. After Roman Catholic emancipation in England in 1829, the interest in Opus Anglicanum was renewed. There were several stand-out pieces such as a stunning mitre depicting the martyrdom of Thomas Becket (1120-1170) , the shield and surcoat of The Black Prince (1330-1376) on loan from Canturbury Cathedral, and the De Lisle Psalter, featuring “The Madonna Master”. There were several medieval charters with fully intact seal bags on display, such as the bag that contained the seal from the foundation document of Westminster Abbey. Another highlight of my visit was watching a video demonstrating how a medieval piece of embroidery was made from start to finish. The effort, skill, and care involved is astounding. It was mesmerizing to see how a piece unfolds. View of surcoat and shield belonging to the Black Prince. at Opus Anglicanum. (c) Victoria and Albert Museum, London. The exhibit isn’t large but make sure you set aside at least an hour and a half to immerse yourself in the beauty of these 800 year old works of art. The pieces are so intricate you really want to take your time to examine them closely and not have to rush through. The V&A has the largest collection of English embroidery works in the world, but due to the age and delicate nature of some of these articles, this may be the last time visitors will have the chance to see them on display. Don’t miss your chance! 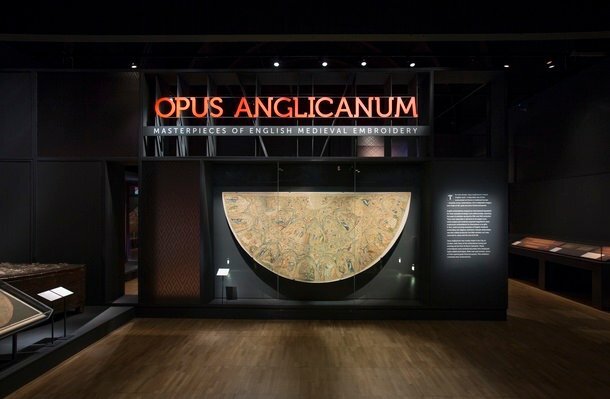 Purchase tickets to Opus Anglicanum: Masterpieces of English Medieval Embroidery. The exhibit run October 1, 2016 – February 17, 2017.